Thank You Village Chevrolet and PWYBA Families!!!! A big thank you to Village Chevrolet and PWYBA families for this past years successful raffle fundraiser. 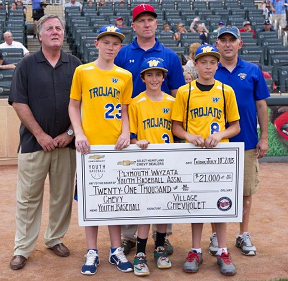 Village Chevrolet presented a $21,000 check to the PWYBA during a Minnesota Twins game at Target Field. Thanks for everyone's generosity. The money will be used to help improve the PWYBA baseball fields.